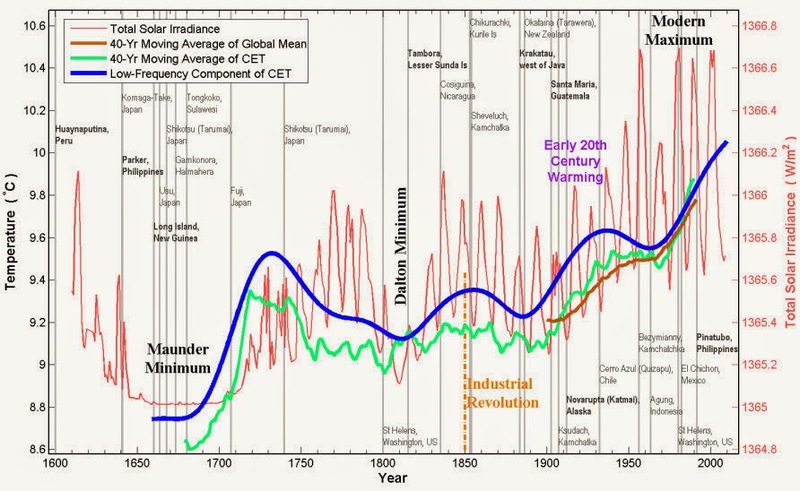 A recent paper presented by Dr. Ka-Kit Tung, professor of applied mathematics, University of Washington, finds a remarkable correlation between solar activity [TSI or total solar irradiance] and the longest continuous series of instrumental temperature measurements in the world, the Central England Temperature [CET] record spanning 350 years since 1659. Dr. Tung also finds there has been no acceleration of alleged "anthropogenic" warming over the past 100 years, despite an exponential increase in CO2 emissions, and that the rate of alleged "anthropogenic" warming is "less than half of the accepted values." 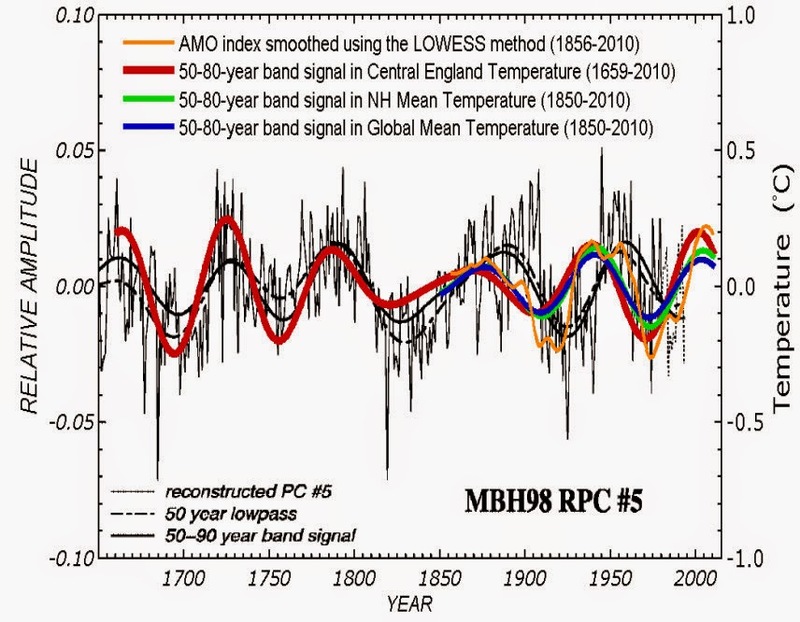 Dr. Tung finds much of the global and Northern Hemisphere temperature variability of the past 350 years can be explained by the natural Atlantic Multidecadal Oscillation [AMO]. Central England Temperature [CET] shown in blue, solar activity [TSI] shown in red. 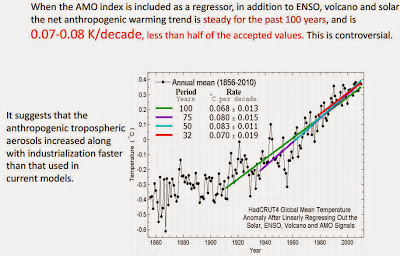 Paper finds there has been no acceleration of alleged "anthropogenic" warming over the past 100 years, despite an exponential increase in CO2 emissions, and that the rate of alleged "anthropogenic" warming is "less than half of the accepted values." Natural ocean oscillations e.g the AMO control Northern Hemisphere [NH] and global temperature. Ocean oscillations in turn appear to be controlled by solar activity and the harmonics of planetary motions. Our work was inspired by the paper of Wu et al. , who showed, using the novel method of Ensemble Empirical Mode Decomposition (Wu and Huang [2009 ]; Huang et al. ), that there exists, in the 150-year global mean surface temperature record, a multi-decal oscillation. With an estimated period of 65 years, 2.5 cycles of such an oscillation was found in that global record. 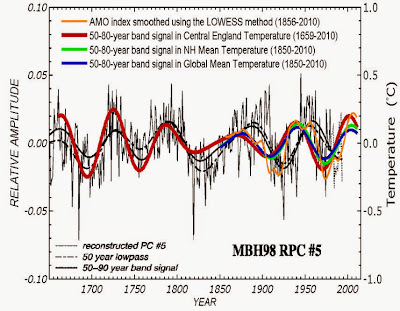 They further argued that it is related to the Atlantic Multi-decadal Oscillation (AMO) and, if this oscillation is separated out, a monotonic trend emerges in the global mean temperature, with little acceleration of warming. 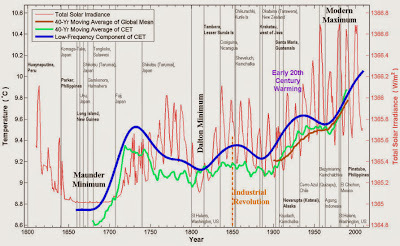 Given the importance of this last implication on the recent anthropogenic global warming, it is quite natural that the scientific community is demanding more evidence that this oscillation is real, recurrent and natural, and in particular evidence that it is not a response to time varying anthropogenic forcing that happens to look like an oscillation. For related talk material, click here.